The CW's superhero shows not only bring in countless characters from the DC Comics, but they also offer some slight nods to superhero history. After The Flash was picked up to series, the show cast John Wesley Shipp, who played the original Barry Allen in the 1990 TV series, and they later cast another actor from that original show, Mark Hamill, who reprised his role as The Trickster. 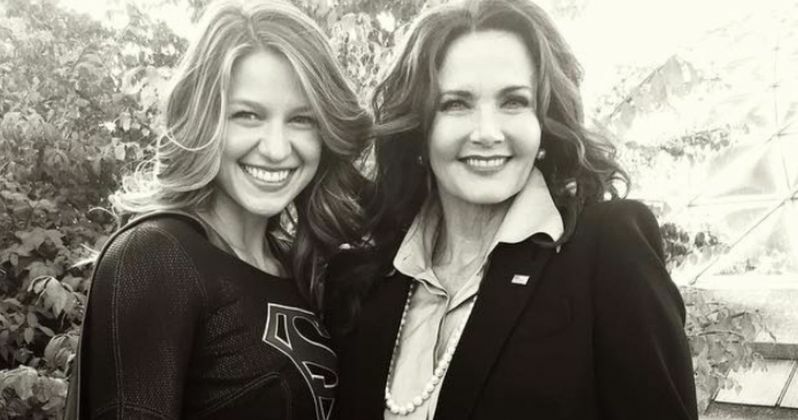 The network's latest addition, Supergirl, which shifted from CBS to The CW this summer, made some headlines of its own when the show cast the original Wonder Woman, Lynda Carter, as the President of the United States, and now we have our first look at the actress on the set, alongside Melissa Benoist. Melissa Benoist posted the photo last night on Instagram, with the actress seen in her full Supergirl costume while Lynda Carter is seen wearing a very Presidential outfit. Of course, we don't know anything about the scene being filmed, but our report from June revealed that Lynda Carter will first be seen in the third episode, and is slated to appear in multiple Supergirl Season 2 episodes. Very little is known about Lynda Carter's character, but hopefully we'll get more details soon. In the first season of Supergirl, Lois & Clark star Dean Cain and the original movie version of Supergirl, Helen Slater, starred as the foster parents of Kara Zor-El (Melissa Benoist), keeping the tradition of casting former superheroes on Greg Berlanti's shows, who executive produces all four CW superhero shows, Arrow, The Flash, Legends of Tomorrow and Supergirl. It was also recently rumored that two more DC Comics characters, Kathy/Kate Kane, a.k.a. Batwoman, and Barbara Gordon, a.k.a. Oracle will be seen this season, but we don't know if they've been cast yet. Aside from Lynda Carter, other newcomers in Supergirl Season 2 include Floriana Lima as Maggie Sawyer, who is the ex-lover of Kathy Kane, Katie McGrath as Lena Luthor and Tyler Hoechlin as Kara Zor-el's famous cousin Superman. Despite switching networks, Supergirl will remain in its Monday 8 PM time slot, kicking off the network's superhero lineup. The Flash will still air on Tuesday's at 8 PM, followed by Arrow on Wednesday's at 8 PM and Legends of Tomorrow on Thursdays at 8 PM. It was also recently confirmed that there will be a two-episode musical crossover between Supergirl and The Flash, which will happen during the back half of this season. There will also be a four-way crossover spanning all four shows, but very little is known about either of these crossovers quite yet. While we wait for more details, take a look at this new photo from the Supergirl Season 2 set, with Melissa Benoist and Lynda Carter.